This model has a very low center of gravity resulting in a high ball flight. The hybrid has Callaway's VFT. This stands for Variable Face Technology. This gives the face faster balls speeds with a sweet spot that covers the entire club face. 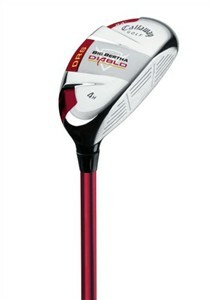 What I like best about the Big Bertha Diablo Hybrid is the offset hosel. Not only will this help you higher handicappers hit the ball with a closed clubface, but for those of you creative types, you'll find this club useful around the greens. With the offset face, you can play some delicate "touch" shots around the green. Practice them around the practice green and impress your playing partners the next time you are out on the links. For those low handicappers, the Diablo Hybrid comes in a tour version that has less offset with a higher center of gravity. The high CG promotes a more penetrating ball flight and a more workable feel for shot making.